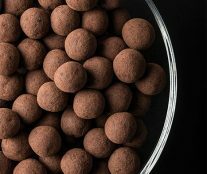 In the “Chocolate” section of the book Four in One, by Ramon Morató, Josep Maria Ribé, Miquel Guarro, and Raúl Bernal, there is an entire chapter dedicated to an impulse product with great possibilities: dragées. Dragées are all those edible products (nuts, spices, sweets …) that by a coating technique are covered with chocolate or sugars, achieving a more or less regular and uniform layer around them. They are usually consumed at room temperature as a snack or aperitif at any time. 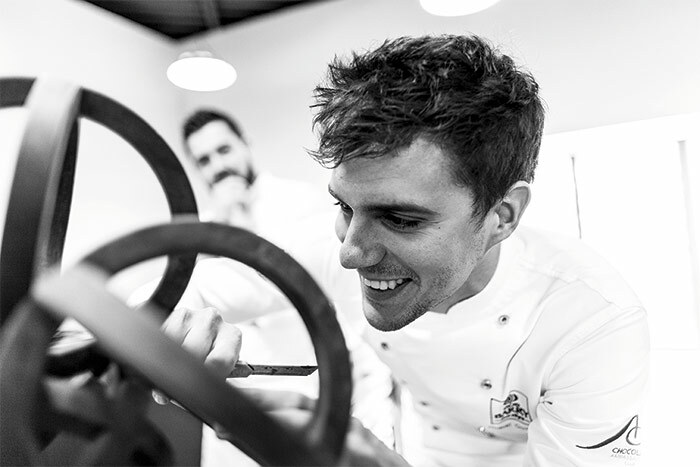 Josep Maria Ribé is in charge of demonstrating the keys for their perfect preparation, analyzing from what types of chocolates are ideal to how to conserve them as long as possible under the best conditions. In the world of chocolate, we are always conditioned by temperatures, and this case is no exception. In order to make dragées, we ideally need the room temperature to be 16 to 18ºC, as well as a very low humidity factor. It can be interesting to use a dehumidifier for this purpose. 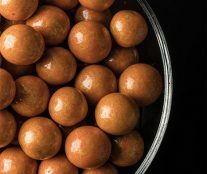 These conditions contribute to the crystallization of the chocolates inside the drums, and also to the quick evaporation of water if any water-based syrups are used to obtain shiny surfaces, as we will see below. The drum is the essential tool in this process. It is a rotating container fitted with a speed regulator and a powerful cold air intake. And, if working with chocolate, a hot air intake is also important. Some drums have interior paddles which are very helpful in the rotation and coating process, and which are especially useful when working with small amounts. If we think of the system of making dragées as a technique which consists of gradually adding hot chocolate into a drum in which a product has previously been introduced in order to be coated with that chocolate, and that all this will happen as the drum rotates at a fairly high speed with some cold air refrigeration to help the chocolate crystallize, then we will realize that the most appropriate chocolate couvertures are those with a medium cocoa percentage – between 55 and 64%. This does not mean that the rest of couvertures are not useful at all. We can currently find dragées with 70% cocoa couvertures or even higher. 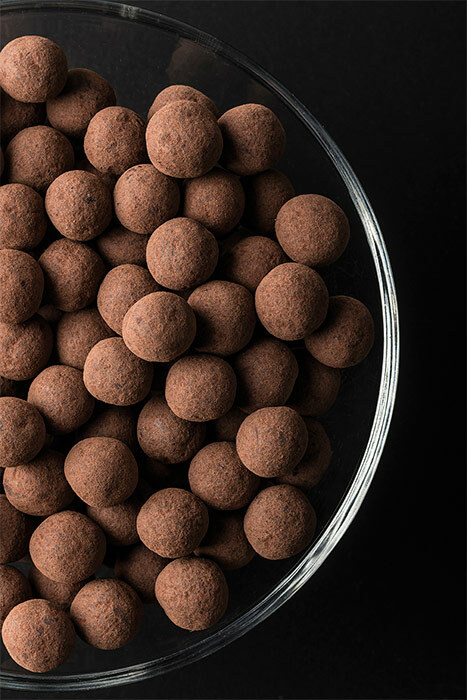 On the other hand, these couvertures with a medium cocoa percentage work better when it comes to polishing the already finished dragées, as a lower cocoa butter content and a higher sugar content will contribute to the appearance of glossiness. 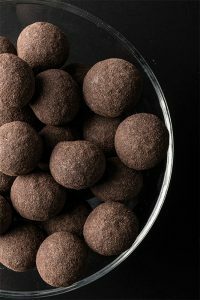 As for the white and milk couvertures, their cocoa butter content is always lower to that of the dark ones, and therefore their hardness is also lower, which is a positive factor when forming the dragées. 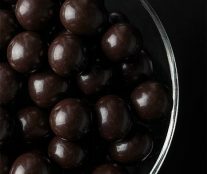 Nevertheless, as they contain some milk fat and even milk powder, the dragées are more difficult to be polished. 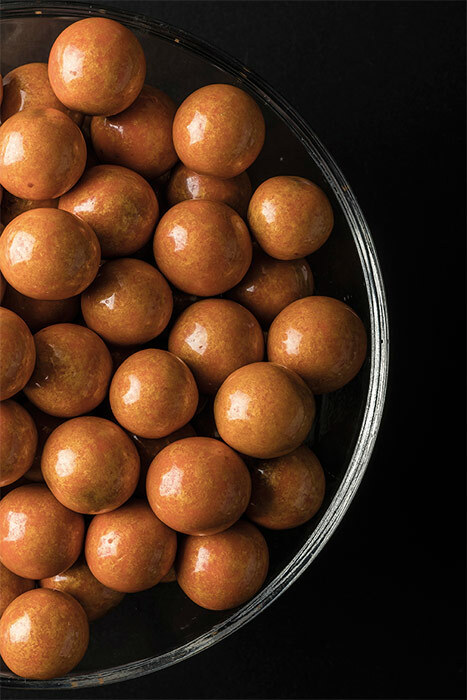 The technique of adding chocolate for making the dragées is as simple as logical. It consists of gradually adding hot chocolate couverture (at approximately 40ºC) into the drum, while this is working, and with the product to be coated inside. 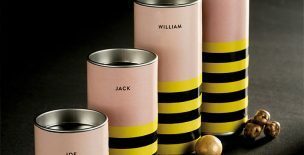 As the chocolate is added at intervals, longer or shorter depending on the size of the product to coat, it is evenly applied and therefore covers the product perfectly while the drum is continuously rotating. 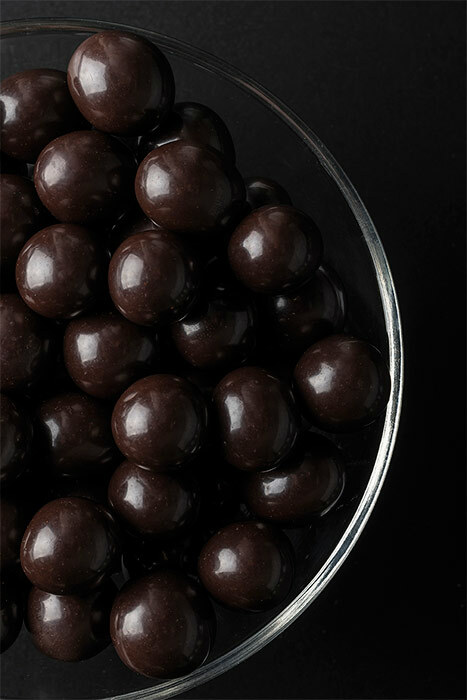 At the same time, cold air circulation (at 10-15ºC) is allowed into the inside of the drum, whose function is to contribute to the crystallization of the chocolate which is added to the product. This temperature contrast is somehow similar to the one we obtain when pouring the chocolate onto a cold worktop. We can therefore state that with this step we temper the chocolate. Once the product has been coated with the necessary amount of chocolate, it is time to give it a shape. If what we desire is to round off the dragées, the cold air intake has to be replaced by a hot air (at 45-50ºC) so that the chocolate layer softens and the dragées start to be rounded thanks to the friction against each other and the drum walls. During this latter phase, the main risk is that the chocolate couverture softens excessively, causing the dragées to stick onto each other. At that stage, we well again replace the hot air by cold air (10-15ºC) so as to cool them down as fast as possible. This process can be carried out as many times as necessary until our objective is reached. Giving our dragées a round form is an esthetic option, but not the only one. However, it will definitely help us during the polishing process as we will see below. Four in One also reviews the different finishes that can be given to dragees: no glaze, coated in a powder product such as cocoa, starch, cinnamon…, and with glaze (natural or water based syrup). In addition, for lovers of glaze, they recommend fixing the glaze as much as possible by applying shellac. Once our dragées are finished, either polished or tossed in powder, we have to store them for as long as possible in the best conditions. This will depend on the type of core which each dragée is made of and the chocolate we have used. 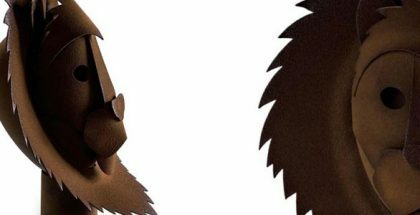 It is highly advisable to store them so as to protect them from the humidity and oxygen as this latter, for example, causes the nut to oxidize. It can be vacuum-packed and with modified atmosphere or simply placed in a package. We recommend that they are stored at a temperature of 15 to 18ºC. 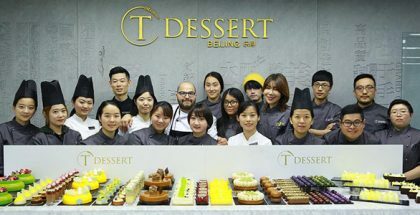 This way, all the processes of degradation of the core are slowed down, phenomena like the ‘fat bloom’ in chocolate are prevented and, in short, the shelf-life of the product is longer. Check out the detailed recipe for Los Dalton, a collection of dragees based on the famous thieves, in Four in One: Averell # 1 (candied orange, 39% Arriba milk chocolate, and jasmine), William # 2 (bitter almond, vanilla, and white chocolate), Jack # 3 (freeze-dried cherry, Sao Thome dark chocolate, and anise,) and Joe # 4 (caramelised puffed rice, ginger, and Brazil dark chocolate).